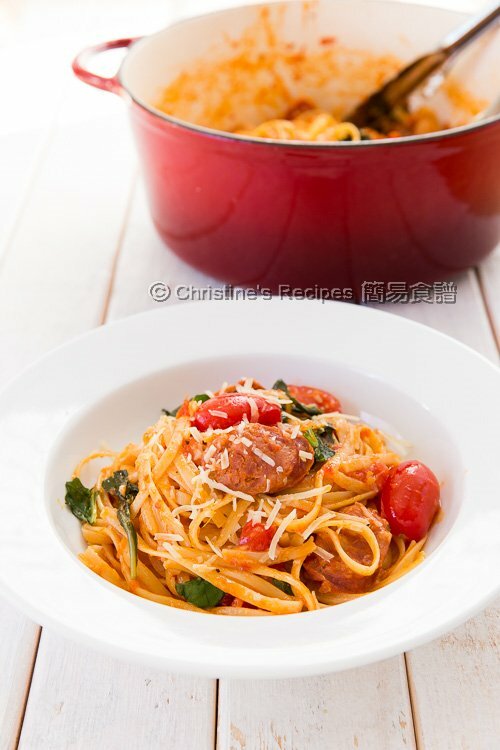 This one-pot pasta with tomato, basil and chorizo is so scrumptious and easy to make. You don't need to strain the pasta. 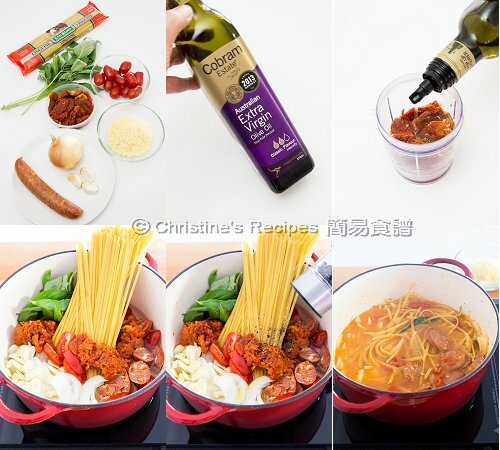 Yes, all the goodies of pasta can be retained in the pot. It works like a magic. This one-pot pasta was our dinner on Valentine’s day. Neither did we need to line up for a table in a restaurant, nor did I need to stand in my kitchen for cooking under such a hot weather. In fact, I don’t like cooking too much on Valentine’s day. My husband could also enjoy the night without too much cleaning up afterwards. To make this dish, all I have to do is to toss all the ingredients into a large pot. After boiling for about 10 minutes, my husband and I enjoyed a large plate of totally flavoursome pasta. The recipe is really a keeper that will surely save me from any hectic days as well. Use a food processor to blend the sun-dried tomatoes with olive oil into a paste. 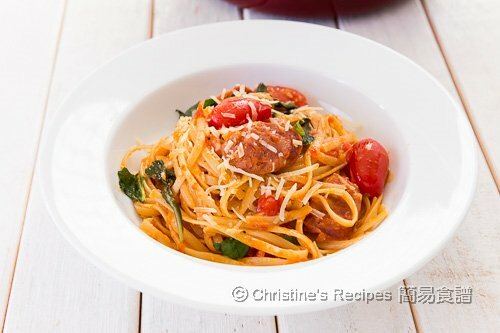 In a large pot, put in the water, linguine, baby Roma tomatoes, sun-dried tomato paste, Chorizo, onion, garlic, basil, sea salt and black pepper. Bring it to a boil without cover, over medium-high heat. Frequently stir and turn the pasta with tongs and don’t let it stick to the bottom. Cook until the water is absorbed by the pasta that turns into al dente, about 10 minutes. Remove from the heat. Stir in cheese as much as you like. Divide into separate serving bowls. Sprinkle cheese on top for garnish. Serve immediately. Baby Roma tomato has a firm texture and tastes less tangy. If they are not handy, cherry tomatoes can be used instead. Linguine is a form of pasta. Mine needs 10 minutes to cook until al dente, and just right for other ingredients as well. If using other forms of pasta, please refer to the recommended cooking time on the packaging. Don’t ever over-cook your pasta. I love this recipe. I know it with meat balls instead of chorizo. I will give it a try. Thank you! Chorizo has a smoky flavour with a little bit of hot kick. We love it. Meat balls are very good too. I love one pot meals. This is such a great lunch! Tried it tonight, yummy and flavorful! Thank you for another great recipe. I used Italian susage as that's what I have on hand. Great for a week night quick meal! Italian sausage tastes good too. Thanks for trying my recipe and glad that you loved it. Is there a way to do this without a food processor? Sure, you can use a knife to chop it up instead. It works for this recipe. Love the looks of this dish. What sort of sun dried tomatoes do you use? Is it from the supermarket deli or the jar/bottle type? Haven’t work much with sun dried tomatoes before. Many thanks for sharing all the great recipes.